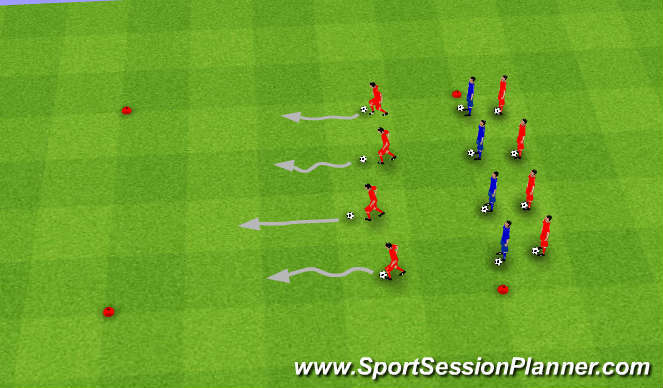 Exercise 1: Divide the team into three groups of four (shown in red & blue for clarity purposes, but not necessary) with all players having a ball. The first group of four players start on one line and perform ball taps (could substitute scissors, foundation, base move, etc.). When the coach yells Go! All players dribble quickly with the ball to the line they are facing and try to stop the ball on the line. The next group should immediately move to the starting line and begin ball taps while waiting for the coach to say Go! Exercise 2: Players now pair up, one ball between two. The players stand side by side with one player (player A) with the ball. 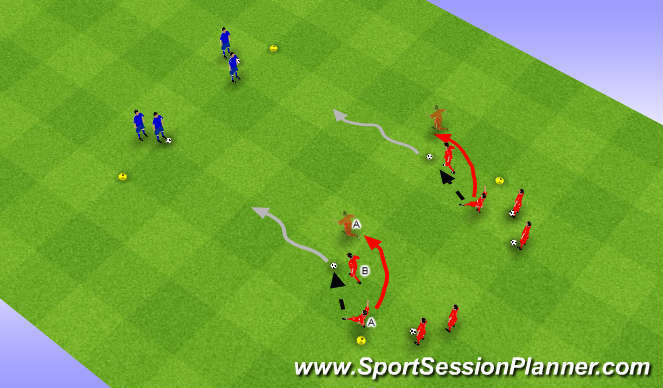 Player A passes the ball slightly forward into the path of Player B. Player B attacks the ball at speed and tries to dribble the ball quickly to the line. Player A overlaps Player B and tries to race him to the line. Note: Players should remain down at the opposite line after the conclusion of the race (pictured in red). Roles reverse on the way back.